Palm oil comes from the palm species Elaeis guineensis. The saturated oil is derived from the mesocarp, or fruit pulp, grown at the apex of the tree below the fronds. The oil of palm is a highly versatile, high-yield vegetable oil that is widely used in products, including chocolate, frying oil, baked goods, breakfast cereals, cosmetics, personal care and cleaning products. It is the most consumed edible oil today. Because of its versatility, the demand worldwide has tripled over the last few decades. Why is palm oil so widely used in the US? Palm oil became a large import of the United States when the Food and Drug Administration determined that all nutrition labels needed to list whether a given product contained trans fats or partially hydrogenated soybean oil. Palm oil is often substituted for cocoa butter because it is cheaper and is semi-solid at room temperature, like solid fats. People use palm oil everyday, but they are likely not aware of what it is, where it comes from, or what implications it has for the environment. Palm oil can be found almost everywhere, if you know where to look and what aliases it masquerades under. (Click here to see the Palm Oil Pseudonym List). Also see 'The (Sometimes Strange) Places Palm Oil Hides' under the 'About Us' tab above. Oil palms can be grown anywhere that has a lot of rainfall and is warm/humid. It is produced in South America, Borneo, Sumatra, Malaysia and Africa. This cheap oil is in such high demand that much of Southeast Asia, especially Borneo and Sumatra, have continued to grow massive plantations of this crop at the expense of the rainforest and its inhabitants. Palm oil is high in saturated fat--it is not a healthy alternative to trans fats. Exports from Indonesia are extremely high. Our consumption is about 2.7 billion lbs. per year. It's in everything: food, bath products, etc. Girl Scout cookies, toothpaste, peanut butter...the list goes on and on. See our list of foods that contain palm oil here. High demand requires more plantations--destruction of primary forests is massive. The majority of species living in those forests are critically endangered, and plantation workers are known to poison elephants and kill orangutans. Many species likely will not survive long. Oil palm plantation workers capture, chain, and sometimes set fire to orangutans caught in recently deforested fields. See the pages under the 'More About Palm Oil' tab above for greater details on these issues. What Does Palm Oil Look Like? What's the Problem with Palm Oil? The problem with palm oil is the way in which it is farmed and manufactured. Current estimates indicate 90% of the rainforests in Indonesia and Malaysia will be replaced by palm oil plantations unless drastic action is taken to find ways of producing it sustainably. Why Should I Care About Palm Oil? In rain forests half a world away from the United States, orangutans are making their last stand for survival. Scientists warn that these gentle and intelligent animals, among humankind’s closest kin, could become extinct within our lifetime if their rainforest homes continue to be destroyed for palm oil plantations. And the primary threat to these animals is much closer to you than you might think: It’s hidden in the snack food aisle of your local grocery store, and likely in your own shopping cart…in fact it’s in 52% of EVERYTHING in American Stores. It threatens to cause the extinction of the orangutan, one of our closest living relatives, within our lifetime due to habitat destruction. Additionally, as orangutans move out of the forest due to habitat destruction, they become pests for local human populations and they are thus targeted and killed. Other animals including the Asian elephant, Sumatran tiger and Rhino are also at very high risk of extinction. Deforestation to build large palm oil plantations across the globe is ruining some of the most bio-diverse areas in the world. Plantations exploit and force their workers into slave labor in developing countries. Palm oil is an unhealthy fat for Westerners who already consume far too many unhealthy foods. Scientists estimate around 15-17% of annual carbon emissions, more than the emissions produced form all the cars, buses, trains and airplanes in the world, are caused by destruction of forests, especially in tropical areas. "The Leuser Ecosystem is home to the densest population of orangutans remaining anywhere in the world and is the only place where orangutans, tigers, elephants, rhinos and sun bears live in the same forest together. The people of Aceh have long fought to protect the Leuser Ecosystem as it also provides them with clean water for downstream irrigation, agriculture and food production and helps avoid soil erosion, flooding, landslides and pest outbreaks. Today, it is at a crossroads. Massive palm oil companies are pushing hard to open this pristine ecosystem up for mass clearing in order to plant palm oil plantations. 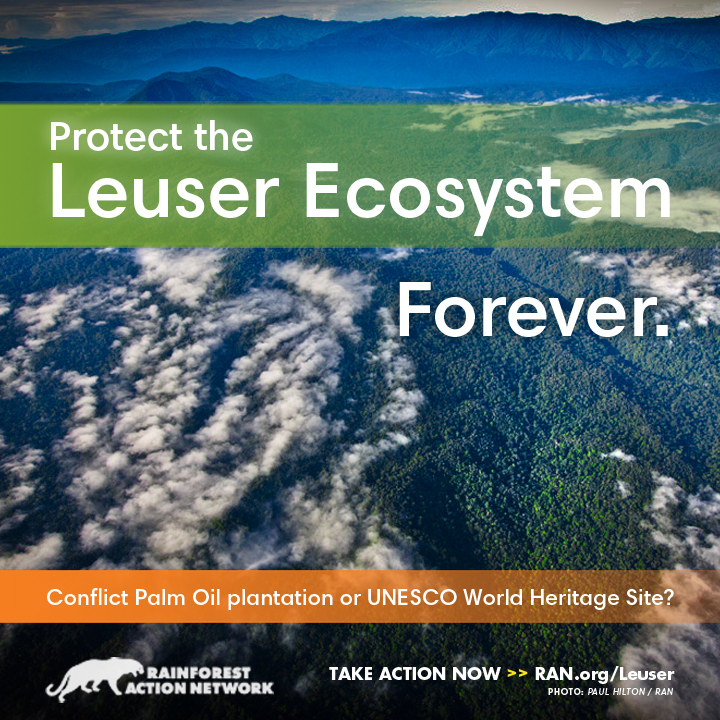 Local activists and community members are being joined by scientists and conservationists around the world to call for protection for the Leuser. And protection comes down to one man, Governor Dr. Zaini Abdullah, who can nominate the Leuser as a UNESCO World Heritage site. "